or sometimes I wish it would, in a nice little funeral pyre, dowsed in petrol! That I can light a cigarette from! Ok, I will forgo the cig. Today has been just a tad frustrating. There are some requirements for my app to integrate with Microsoft SharePoint (also known as MOSS). I knew this would be needed when I started on the application, though I expected it to be necessary after version 1.0 was rolled out. Requirements change though and it looks like we need our own backup strategy to supplement the company one. 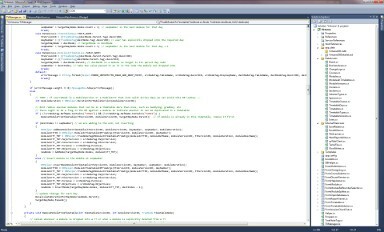 The challenge with SharePoint is there are many different ways of doing this, depending on what version you are working with, which development environment you have installed, and which SDK tools you have. Most appear mutually exclusive and the documentation is pretty awful, which is unusual for Microsoft. It reminds me of MS Site Server which I have programmed applications for before and I suspect that’s part of the problem here. It feels like an evolution of MSSS, something that has grown in an organic way, rather than designed from the ground up with a clean application interface. With all the different versions of tools and SDKs, even the forums provide little help. Still, I have the skeleton code working now, it didnt take a few hours, it took all day and isn’t quite as far along as I had hoped. But we persevere. I made progress and got it doing what it needs to do. Take that SharePoint. And I know, that a month ago, I would have burnt through a full pack of smokes today. Easily. Staring intently at the screen, not even acknowledging how many I lit up. This is pretty impressive actually. I got my head around the interface. And I haven’t really had the burning yearning for a cigarette. Despite the headache it has been, today has been another good day. Me and SharePoint will have a rematch one day soon I am sure.